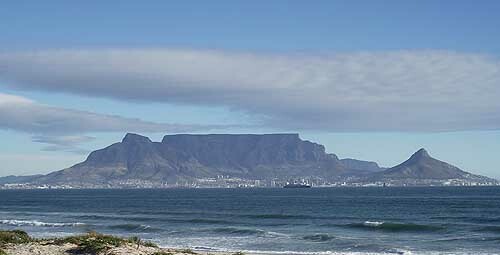 Table Mountain is one of the most well known features of Cape Town and has just been declared one of the seven natural wonders of the world. 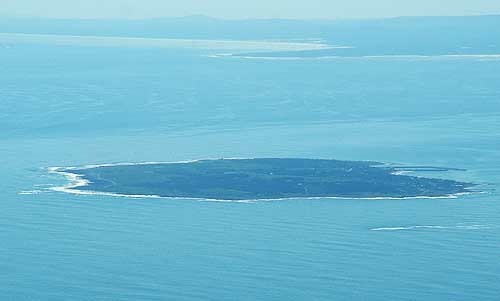 The mountain rises 1086 metres almost vertically from the sea. 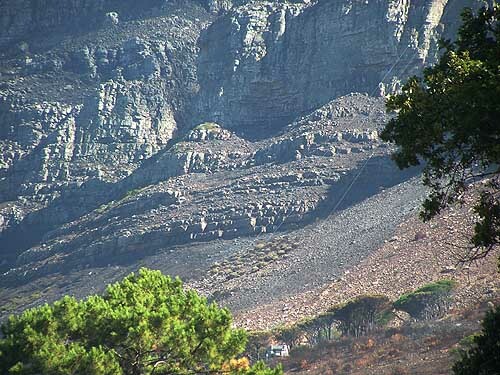 The slopes of the mountain on the Atlantic coastline end in the sea and in years gone by when the sea levels were higher the western side of the mountain would also have been lapped by sea. Today the valley where seas once washed through is called the Cape Flats and is the home to millions of people who have migrated from the Eastern Cape and elsewhere to live and find work in the city. 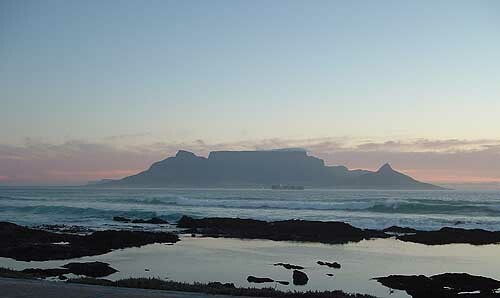 Table mountain, the icon of Cape Town is made up of a number of different rock formations. 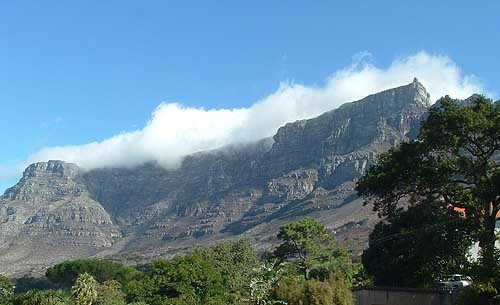 The mountain was formed many millions of years ago when a volcano pushed magma to the surface from under the sea bed. The sea bed in those days was made up of mud and clay covered by sand and if you look at the mountain you will see evidence of this in the rock formations of the mountain. The base of the mountain is made of granite which is magma that has cooled down and hardened. Above the granite foundations of the mountain are the clay and mud levels now called shale which were hardened and turned to stone by the heat of the magma pushed up from underground. Above the shale forming the top of the mountain is the sand stone . These rocks were also hardened by the heat of the cooling magma from the underground volcano when the mountain was formed. Over the years weather sun and rain have eroded the various rock formations leaving us with the mountain we have today. 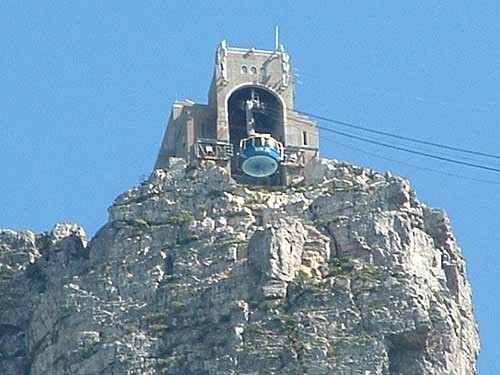 Who cannot identify Devils Peak, the Twelve apostles and Signal Hill just to mention a few of the well known aspects of the mountain. So why has the mountain been selected as a natural wonder of the world. 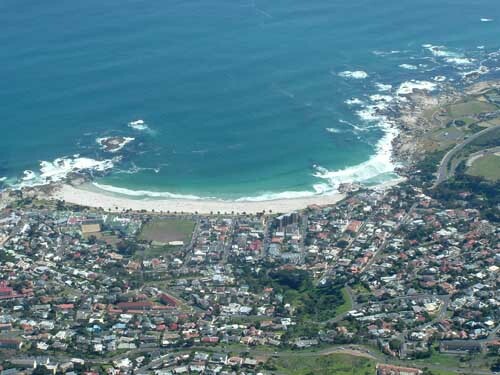 Everybody in Cape Town loves their mountain which surrounds the city like a mother looking after her child and voted for it to become a wonder of the world. 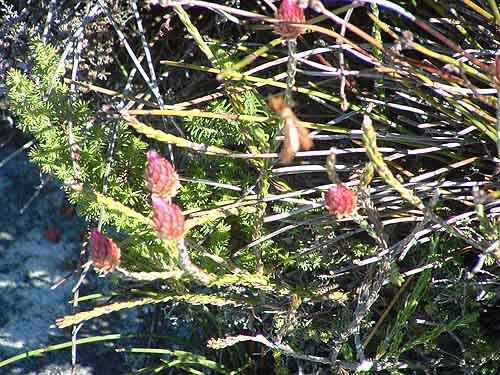 The mountain in has more species of plants on its slopes than you will find in the United Kingdom and most of then are endemic to the mountain and not found naturally anywhere else in the world. The mountain has many moods, some days it is absolutely magnificent with no cloud cover. On other days when the strong south easter pumps across the Cape Flats its mood changes and it is covered by a cloud layer know to Capetonians as the table cloth. When the wind blows the mountain becomes unfriendly for people especially at the top as the cloud cover blocks out the fantastic views one can see from the top. The wind and cloud also cool the top of the mountain and it can become pretty chilly. The fog that rolls in with the south east wind and forms the tablecloth can become so thick that people cannot find their way back to the cable car and end up getting lost and sometimes dying on the mountain. 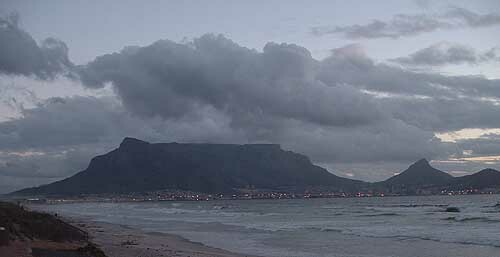 In the winter months when the south east winds subside and the northwesters start to blow causing storms over Table bay the mountain takes on a threatening look with heavy storm clouds hanging over it. When the winter rains fall and drench the mountain the mountain becomes a wonderland of small waterfalls and streams rushing down the slopes into the city. Much of the water that runs off the mountain ran underneath the city in tunnels to the sea. With the building of the new Green Point Park and stadium much of the water is now being captured by the city and being piped to the park to irrigate it and the new stadium. Back in the 1650's this water was used by the Dutch to irrigate the Company gardens and supply water to the growing colony. Over recent years in the dry summer months the mountain has been devastated by fires, in some instances caused by arsonists and others by careless visitors throwing burning cigarettes out of their cars into the dry summer grasses on the mountain. The mountain when compared to other mountains looks easy to climb and has a number of pathways winding their way to the top. If the pathway is meticuously followed by the climber he should not have a problem but should he take a wrong turn along the way he could end up on a steep cliff face and have to be rescued. Unfortunately many climbers going up the mountain end up in trouble as they have failed to take the necessary precautions. Many people are just plain stupid and take on the mountain in the wrong shoes, with no water or warm clothes and do not tell people where they are going. In many instances they get caught at the top when the table cloth comes down and are unable to find their way down. This necessitates the mountain club to have to do searches in terrible conditions risking their lives to save people who have not followed a few simple rules. All these issues can be avoided but there is one unfortunate problem that keeps coming back to haunt the mountain and that is the one of crime. 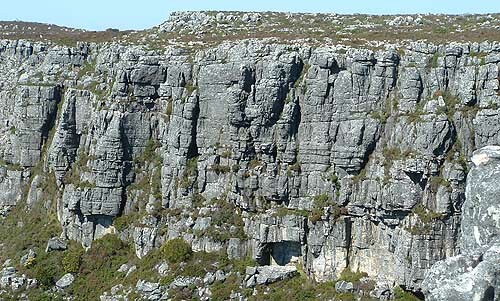 Table Mountain is being targeted by criminals who lay in wait for people enjoying a day out walking or cycling on the mountain tracks. These criminals are proving to be pretty elusive so people using the mountain are being warned to take precautions. Having mentioned the crime, its not all doom and gloom on the mountain. 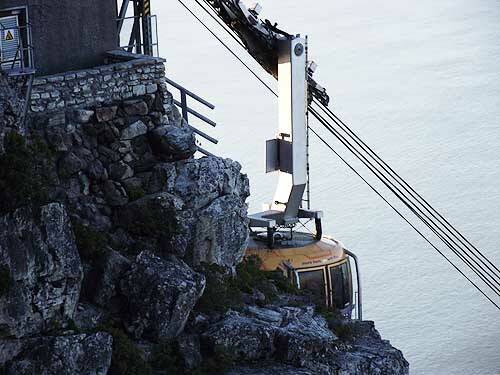 The cable car to the top is pretty safe and people using it can enjoy a five minute ride to the top in a car where the floor rotates a full 360 degrees giving everyone in the cable car a view of the mountain and the city below. At the top one can look out over the city and take some fantastic photos. 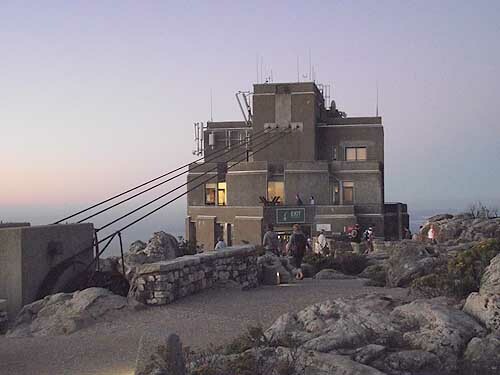 In the summer months many people take advantage of the cable car which runs later into the evening allowing people to go up and have sundowners and watch the sun set over the Atlantic. Pathways have been built around the top of the mountain allowing people to walk around without destroying the many plants which grow on the top. 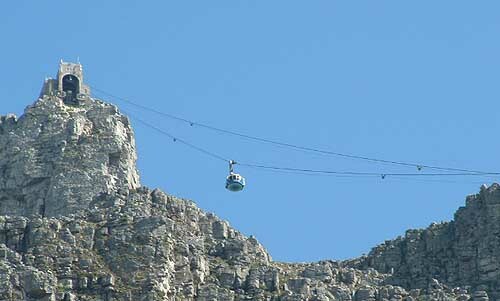 Cape Town is proud of its new wonder of the world and would like to invite everyone living in or visiting Cape Town to visit the mountain. It's an experience you won't forget in a hurry.